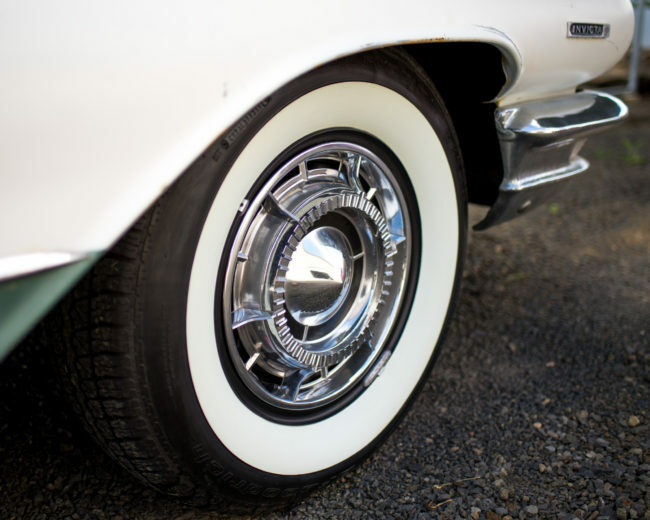 Most classics prior to 1962 had wide white wall tires as an option when purchased new. And most look their best wearing a set. The ’60 Buick Invicta Convertible is no exception! If money were no object, there would have already been a set on this car long ago. But, you’ll spend just over $1000 after shipping to get a set, as of this writting. I got lucky though… my brother Marty’s hotrod shop happened to be doing work on a customers ’56 Buick Special convertible, which came in with a set of Coker Tires best radial white walls from the B.F. Goodrich molds. A different tire size was needed, so these slightly used, but like new tires were available for half price. DING! SOLD! Here is the result! Changes the whole personality of the car, in my opinion. You might also note the addition of a set of Super Deluxe Wheel Covers, an upgrade option available when the car when was new. Nice score!! Car looks great with those tires/wheels! I wonder if the bit of exposed wheel rim edge might look nice with the body color rather than black?